For other countries in the world October 8 is just an another day of the year but for Pakistan it is a tragedy that Pakistan might never forget! It was a normal day of Ramadan (Muslim’s fasting month) in the country, as Islamabadis were mostly at home resting or taking nap after early morning’s Ramadan meal while many children of other cities were also at school what awaited them was truly unpredictable and in minutes a normal day turned into the most darkest days in the history of Pakistan. At about 8:52 am PKT a major earthquake jolted the northern areas of Pakistan and adjoining areas of Afghanistan and India. On October 8, 2005 at about 8:52 am PKT, a major earthquake jolted the Kashmir region with Pakistan-Administrated (PoK) being the worst affected along with Khyber and Indian-Administrated Kashmir (IHK). The capital of PoK, Muzaffarabad was just about 19 km northeast from the epicentre of the earthquake. At the time of the earthquake, the United States Geological Survey (USGS) recorded an earthquake of magnitude 7.6 while the Japan Meteorological Agency reported that it was a 7.8 magnitude earthquake. The northern areas of Pakistan mainly the Kashmir region lies on a very active fault line. It lies on the boundary of the large Eurasian and small Indian tectonic plates, both are deadly plates that are colliding with each other. The small Indian plate that underlies most of India and Pakistan, including much of Kashmir. While the vast Eurasian plate that underlies Europe, China, Russia, and much of the Middle East. The motion between the two plates is causing the mountains to push upwards; over millions of years this motion has built the Himalaya range. 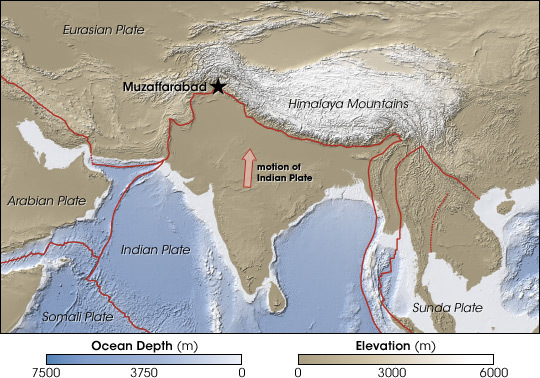 This earthquake was also the first quake in the Himalayas that produced a surface rupture. In the past not one of the earthquakes in the Himalaya has ever produced a surface rupture, not in Nepal nor India. By October 27, there had been more than 978 aftershocks with a magnitude of 4.5 and above that continued till many weeks. Since the earthquake, parts of mountains above the epicentre of the quake have risen by a few metres as shown by satellites, giving ample proof that the rising of the Himalayas is still going on. Pakistan becomes a failed state! 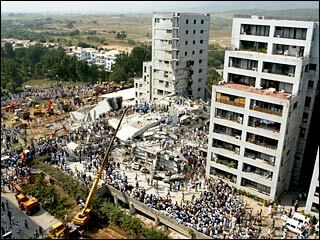 The then Pakistani government handled the disaster with maturity and within minutes the Pakistan Army was on the spot. The international community did an amazing job in motivating other parts of the world to come forward and help the country. But it was the economy that was hit the hardest! In 2005, Pakistan was ranked 34th in the same list but the earthquake changed it all. The Kashmir earthquake was blamed for such a sudden rise of Pakistan in becoming a failed state and the country’s booming economy became a fragile economy. Now every year on October 8, at about 8:52 am Pakistan observes one minute silence for those who lost their lives in the Kashmir earthquake.